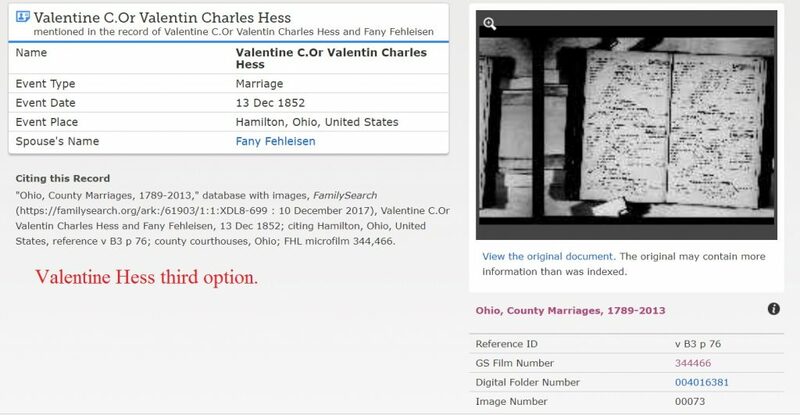 Ancestry.com’s record entry for the 1852 Hamilton County, Ohio, marriage record of Valentine Hess and Fanny Fehleisen indicated that it was located on Family History Library microfilm roll number 000344466. It didn’t tell me much else. The icons on the far right indicate that the roll can either be viewed manually or searched. A search for the last name of Hess in roll number 3444466 located three references for the marriage of interest. This option gave the original film number from which the index item was made and had a link to the entire roll of original film and not to the specific image. 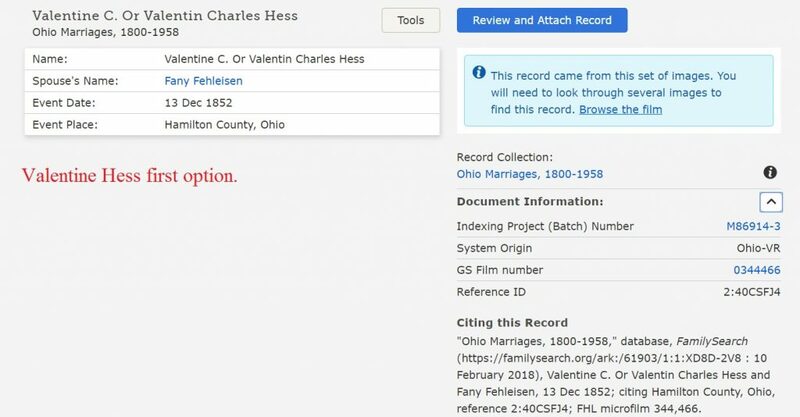 This option linked to the couple’s entry in the online family tree at FamilySearch citing the specific marriage record as the source for the marriage. 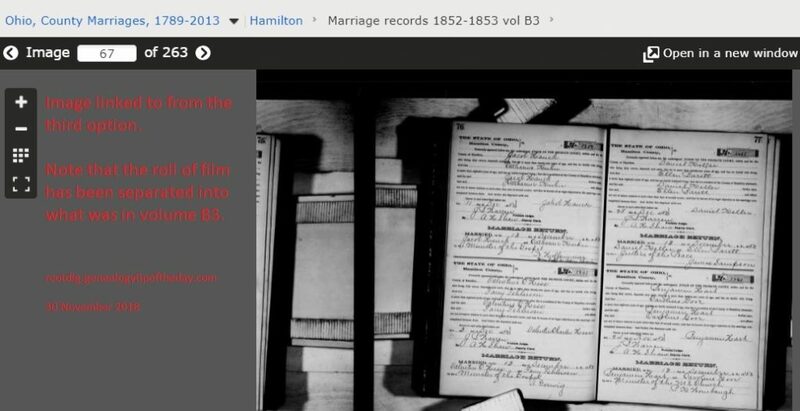 There was no link to the digital image of the film, but there was a link to the database of Ohio marriage records in which the marriage’s index entry appears. This option lead to the specific image from which the index entry was made. 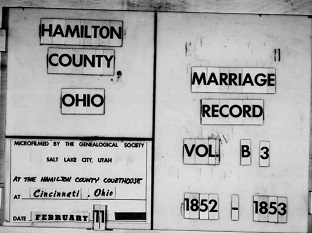 This set of images apparently was from the original roll of microfilm, but set off to only include the book in which the original marriage entry was made. The screen shots of the options are shown below. Image of screen when first Valentine Hess option is chosen. Image of screen when second Valentine Hess option is chosen. Image of screen when third Valentine Hess option is chosen. The screen shot of the image the third option linked to shows that the item of interest was image 67 of 263 images and came from the “Marriage records 1852-1853, vol B3.” This suggests the volume from which the image was originally taken. However, the first image in this series of 263 images did not link to any sort of title page, cover, book spine, etc. to confirm that. The good thing was that this image told me that the entry for the Hess marriage was on page 76 of the book. That page number was on the screen that came up after I clicked on the third option (see image). So I went back to browse the entire roll of microfilm–roll 000344466. Having the page number was a definite advantage. I located the page of interest in the actual roll of microfilm (image number 73 of 548 images) and confirmed that the item was from record book B3. I didn’t doubt that it did, but doublechecking is never a bad idea and there is always the chance that there is a page of two of explanatory material that may help me to understand and interpret the records correctly and more accurately. I did notice that for having been created over a period of time, the records seemed to exhibit extremely consistent handwriting. In fact, it seemed that they were almost written by the same person. The form suggested that the “original” of this item had been signed by the groom and that what I was looking at was a copy of a record–not the original. 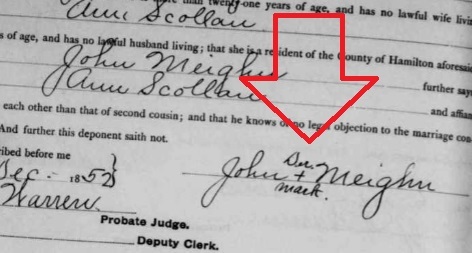 Looking at other marriage records in this same series, I noticed very consistent handwriting. That was suggestive that these were not the original records. Then I noticed that the card catalog entry for the marriage records as a whole indicated that they were “restored” records. 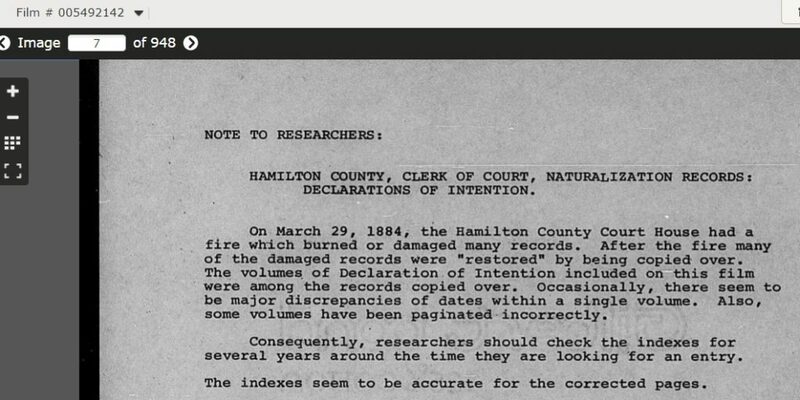 A little research indicated that the Hamilton County Courthouse was destroyed by fire in 1884. Then I remembered a screen I had encountered on the images of Hamilton County, Ohio, naturalization records I had used several years ago. That notation indicated that some of the records had been recopied after the fire. It indicated that the naturalization records were among those copied over. That would explain the consistency of the handwriting in the marriage records I had used. And that matters. It appears likely that the original marriage entry for the Hesses contained the actual signature of Valentine Hess–which has been rendered Valentine Charles Hess in the “restored” record. But I’m not looking at the actual record. There’s a chance that the clerk could not read Hess’ handwriting–particularly if it was in a Germanic script as I’m suspecting. The clerk making the copy after the fire would have had the name of Valentine Hess elsewhere in the marriage record written by the 1850-era clerk to guide him in reading the signature. But it’s possible that he just guessed at Charles as the middle name. My transcription of this document needs to include the complete analysis of the record–and how it came into existence. This analysis is always helpful. In this case, it’s particularly so because it’s possible that if Hess wrote in a script that was difficult to read that he wrote a name that someone years later, unfamiliar with the script interpreted as Charles. And perhaps that name was Christian. Which makes it possible that this man is the Valentine Christian Hess for whom I am looking. 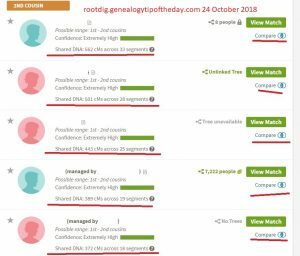 If I had just taken the image Ancestry.com gave me and had not analyzed it, I might never have realized this. Sometimes it’s more than just getting the volume and page number from which a record was taken. Thanks for mentioning naturalization records in Hamilton County. I’ve never found any naturalization record for my ancestor who married in Hamilton County in 1850. He was never a resident of Ohio, but lived in SE Indiana and later Illinois. This is another place I should look.